F-Prot is a quick and easy to use antivirus software package, specially designed to protect your data from virus infection and to remove any virus that may have infected your computer system. Running on all Windows versions, this security software package has various components that help keep your system secure from viruses, backdoors, trojans and other malicious programs. F-Prot Antivirus for Windows currently detects more than 308800 known viruses, worms, trojans and other threats against the security of your system and your data. In addition, the program's innovative and integrated heuristic detection capabilities provide the best possible protection against unknown future threats that may emerge. · E-mail protection that provides automatic real-time protection against threats from incoming and outgoing e-mail attachments. 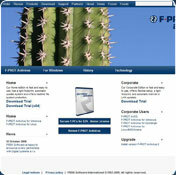 · Many, many more details on the features of F-PROT Antivirus can be found in the datasheet. · 9 megabytes of free disk space. · Microsoft Internet Explorer version 4.0 or later for successful installation and updating of virus signature files. You cannot download any crack or serial number for F-Prot Antivirus on this page. Every software that you are able to download on our site is legal. There is no crack, serial number, hack or activation key for F-Prot Antivirus present here. Our collection also doesn't contain any keygens, because keygen programs are being used in illegal ways which we do not support. All software that you can find here is freely downloadable and legal. F-Prot Antivirus installation package is prepared to be downloaded from our fast download servers. It is checked for possible viruses and is proven to be 100% clean and safe. Various leading antiviruses have been used to test F-Prot Antivirus, if it contains any viruses. No infections have been found and downloading F-Prot Antivirus is completelly problem free because of that reason. Our experts on malware detection tested F-Prot Antivirus with various spyware and malware detection programs, including fyxm.net custom malware and spyware detection, and absolutelly no malware or spyware was found in F-Prot Antivirus. All software that you can find on our servers, including F-Prot Antivirus, is either freeware, shareware or open-source, some of the software packages are demo, trial or patch versions and if possible (public domain licence), we also host official full versions of software. Because we want to be one of the fastest download sites on the web, we host all the software including F-Prot Antivirus on our servers. You cannot find here any torrents or download links that would lead you to dangerous sites.